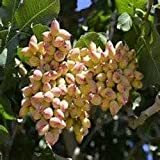 Pistachio tree for sale are usually in the form of bare root grafted trees. Seeds are also grown for 3 to 5 years before transplanted but grafted trees are recommended for home gardeners. It is best planted in the spring between months of January and March. Pistachio trees are a little picky when it comes to temperature. The ideal temperature for them to grow well is above 100 degrees Fahrenheit. It also needs the cold of winter months (45 degrees Fahrenheit or below) to complete their dormant period. Pistachio trees are long living and can grow up to 20 to 30 feet. It will take them 5 to 7 years to bear after planting. Location – Choose a sunny location, the hotter the better. Pistachio trees do not do well at high elevations because of the cool temperature (in desert area can grow in high elevations area). Choose an area where it does not dip below 15 degrees Fahrenheit. Avoid areas with high humidity as well. You would need plant at least 2 trees, a male and a female, to facilitate pollination. They need to be placed next to each other or within 50 feet to be successful. For this reason, plant your pistachio trees in a wide open area away from homes and other structures. Soil – This tree will do well in all soil types but will truly thrive in a deep sandy loam that is well-draining. There is generally no need to amend soil as they can grow even in lean, rocky soil that is low in organic matter and nutrients. Planting – Pistachios should be planted 20 feet apart. Dig a hole a little larger than its root ball, and plant the young tree at ground level. And since pistachio trees are often lanky, a little support will go a long way. Place a couple of stout wooden stakes for the first few years. Use rubber ties to secure the tree to the stakes to avoid damaging the trunk. Also maintain a layer of mulch over the tree’s root zone. Water – Regular deep irrigation every few weeks is needed to grow a healthy pistachio tree. Keep the tree in good moisture content April through mid-September. Do not water October or November to aid the tree in going dormant. After the tree is dormant, a monthly watering during the winter months will help the tree be more cold resistant. Once established, your pistachio tree becomes extremely drought tolerant. Fertilizer – Do not put fertilizer in the hole during the planting procedure, but do fertilize with a tree fertilizer containing nitrogen, phosphorus, and potassium each spring. Pruning – Pruning is an integral process to produce higher quality of fruit while also controlling its growth. Prune off the lower branches as the tree grows to develop a single-trunked tree with its braches beginning 4 to 5 feet from the ground. You may prune two to three times a year with summer pruning occurring in the spring and summer and dormant pruning in the fall.